A Premium Domain Name is a high value web address that has been reserved by the .nyc Registry. These include popular keywords and generic terms that are highly searched for and/or brandable marketing terms and call-to-action phrases that create and drive web traffic. While the vast majority of Premium Domain Names are available for real-time purchase through .nyc retailers, a select few were reserved for public auction. These names will be made available through a series of online and/or offline public auctions with similarly themed domain names, grouped by verticals and interest categories. Starting bids for all .nyc premium domain auctions start at $500. This low entry point for a premium domain is intended to encourage maximum participation by the broadest possible cross-section of New Yorkers. Each .nyc premium domain auction will provide a minimum of 30 days’ notice to the public prior to the auction end date. In addition, information about the .nyc auctions will be posted here and on our OwnIt.nyc website, and relayed to subscribers of the .nyc newsletter. The auctions will also be promoted via various advertising and social media channels to ensure for maximum exposure and community engagement. .nyc Premium Domain Names will be auctioned off to the public in a series of on-and off-line auctions throughout the year. Please check back to our website regularly for updates and information about future auctions, and sign up to receive our newsletter to be kept in the loop. When .nyc Premium Domain Names are not included in a themed auction, they will be available through some of the most reputable Aftermarket providers in the industry. Prior to the announcement of any themed auction, your desired .nyc web address can be easily searched and acquired at listed Buy-Now prices from an Aftermarket provider or through .NYC RETAILERS where aftermarket listings are also included. Once a .nyc themed auction is announced, and prior to the start date of any auction, .nyc Premium Domain Names may still be acquired at a Premium Buy-Now price. After an auction period is announced for a particular .nyc Premium Domain Name, the Buy-Now price will include an increased premium fee (generally 25% of the listed Buy-Now price) to remove a .nyc Domain Name from an announced auction. You may only acquire a .nyc Premium Domain Name that has been announced for an upcoming auction from the Auction Provider. Please contact the current Auction Provider for more details on how to acquire and remove a .nyc Premium Domain from an announced auction. For information on the current Auction Provider, please see HOW IT WORKS. Lastly, if a .nyc themed auction is in the open bidding period, the only way to acquire your desired .nyc Premium Domain Name is to participate in the auction and place the winning bid during the scheduled .nyc auction period. In order to conduct a fair and transparent auction, Sedo requires certification of bidders that want to place bid over $10,000 USD. 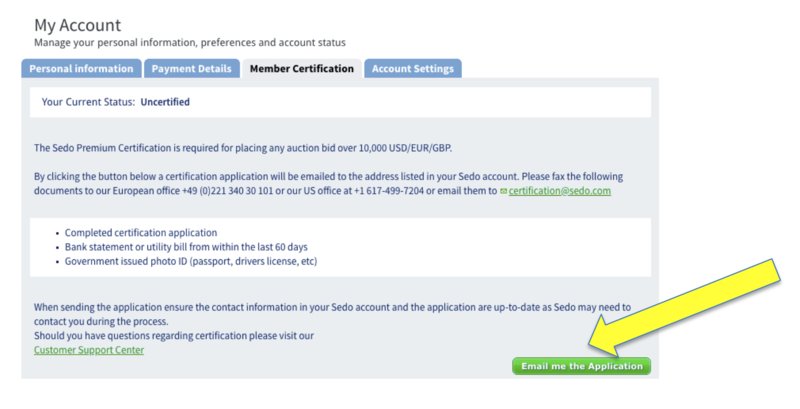 You can certify your Sedo account at any time, even before the auction begins. Please make sure to certify in advance to avoid any bidding issues or delays. Step 1: Log in to your Sedo account and go to My Account from the dropdown menu under your name once logged in. 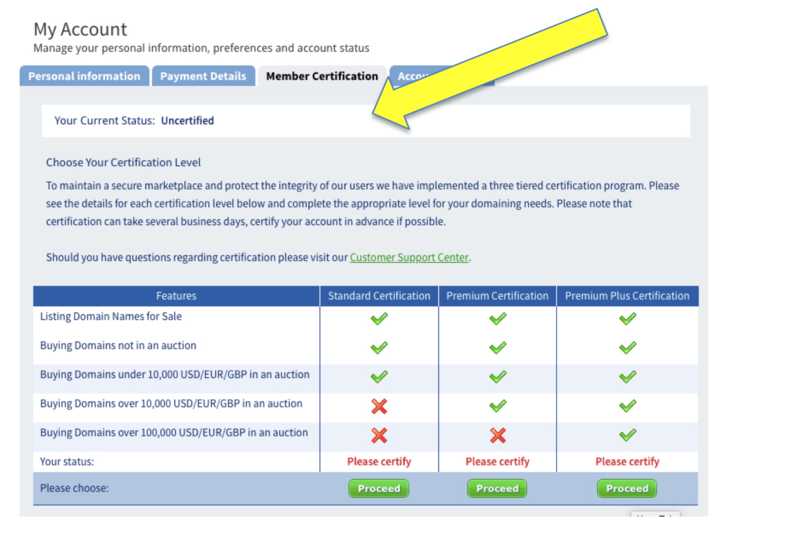 Step 2: Click on the "Member Certification" tab to find out your current certification status. Step 4: Click on the green "email me the application" button and you will be sent the certification application. Complete this and provide a copy of one of the documents requested in order to certify your account. To start, the .nyc auction is set with a low, $500 starting bid price to ensure that the broadest cross section of New Yorkers can participate. A significant marketing and promotional campaign will take place to ensure for maximum exposure and awareness about the availability of these high value .nyc domain names. From there, a fair and transparent bidding process will determine the winner of each domain name, and market forces will determine the ultimate price paid. 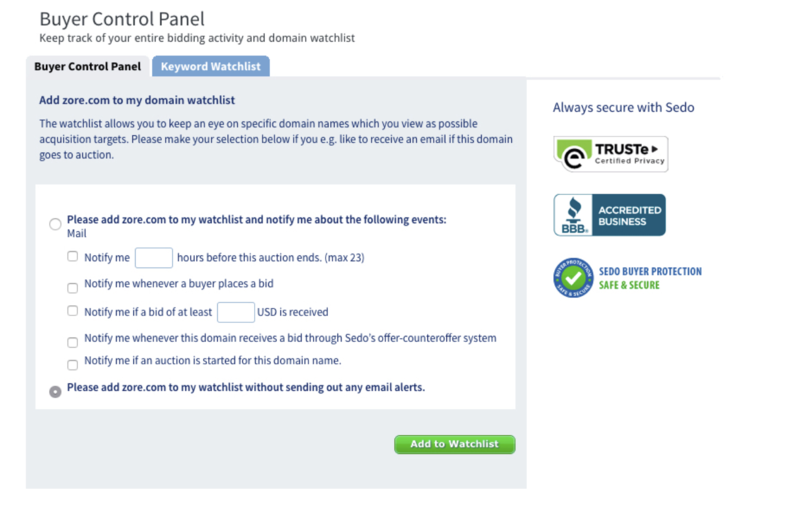 To sign up for .nyc premium auctions you must register with our domain auction partner, Sedo.com. From Sedo's home page click the "Register" button in the upper right corner to begin the account creation process. Learn more about the Sedo process HERE. Great care was taken in the creation of the .nyc premium name reserve list to ensure that the rights of trademark holders are respected. The list of .nyc premium reserved domain names generally consists of generic terms and keywords that are intended to minimize the likelihood of infringement claims. This said, we do not control the way a registrant may choose to develop a domain name. As such, in the event of a claim of trademark infringement, the .nyc Registry has implemented the rights protection mechanisms stipulated by ICANN, including the Uniform Rapid Suspension and the Uniform Dispute Resolution Policy. While there is an official start and end time to an auction, extended time for bidding will occur if a bid is placed within 5 minutes of the scheduled close time. Any additional bids will extend that domain name's auction close time by 10 minutes. This can happen multiple times and delay the expected end time of an auctions. Please contact us at premiums@ownit.nyc with any additional questions or inquiries.